I'm constantly trying to find roof top views of London. The city looks so different either looking up or looking down from somewhere high. 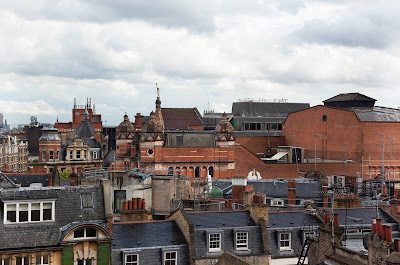 This view looking over the roof tops of Soho is taken from Central St Martins University. The campus is to be relocated to new premises in Kings Cross for the next academic year. Looks like developers will turn the current building into apartments, offices and luxury hotel. It seems as if everything is reaching for the sky! London needs another luxury hotel and more very expensive apartments . . .
Love the sky. I can almost hear it rumble! Views like this are always interesting, sorry to hear about the building plans. Roof views are always good. It's odd but every time I see a pic like this, I inevitably say : All those apartments and houses are lived in, by people, ... all those people! Can you imagine all the stories each and every one of them call tell. Can't help it... happens every time. Love this view! Nice shot Mo. This is a great view! I always like looking at views like this. Yeah, I love views like this. Can be quite disorienting, but great fun. 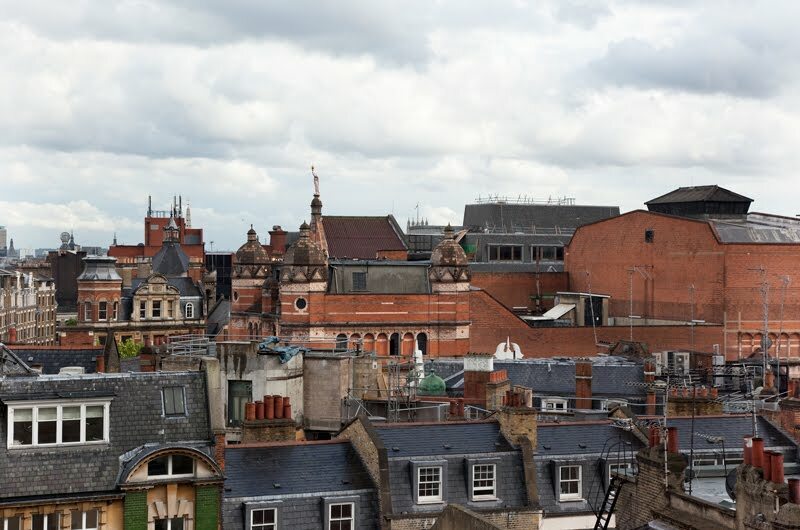 The rooftops are not as red as what Jilly showed earlier this week. Great view. Rooftops are so interesting! i like views from the roof top too ! this one is very good ! Another way to see LONDON!